Preheat oven to 375°. Heat an 8 inch ovenproof non-stick sauté pan over medium-high heat. Add the olive oil, onions and potatoes and cook until they begin to brown. Add the asparagus and season the vegetables with salt and pepper. Sauté for 2 minutes and then reduce the heat to medium. Beat the eggs, Tabasco, herbs, lemon zest, salt and pepper together, pour over vegetables. Sprinkle the smoked salmon over the eggs and stir to mix all the ingredients. Cook for 1-2 minutes until the eggs begin to set and then place the pan in the oven. Cook until the eggs have set and puffed up a bit, about 15 minutes or until set. Remove from the oven, let cool a few minutes then place the oven proof serving plate on top of the pan and invert the pan so the frittata drops onto the plate. Top with the swiss cheese and put back into the oven to melt the cheese. Remove from the oven, slice and serve. 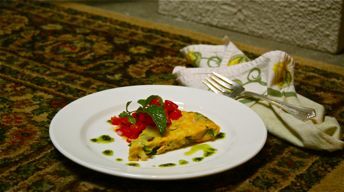 The frittata could be served topped with tomato salsa also.